Chinese artist Ai Weiwei at the Royal Academy of Arts on September 11, 2015 in London. The Lego Company rejected a bulk order from Weiwei for art installations. 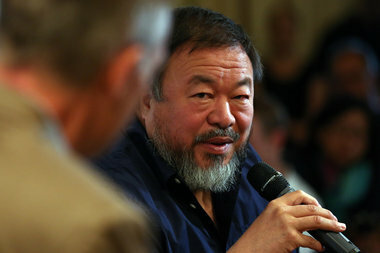 PROSPECT HEIGHTS — Chinese artist Ai Weiwei said Wednesday on Twitter that he will be accepting donations of Lego bricks at the Brooklyn Museum after the company rejected his bulk order for the toy pieces for an upcoming art installation. A spokeswoman for Brooklyn Museum confirmed to DNAinfo New York that it will begin collecting Lego pieces Thursday on behalf of the politically active artist. "The Brooklyn Museum will be the collection point in New York for LEGO donations. Starting 10/29, drop-in deliveries will be accepted in a BMW vehicle located in front of the main entrance to the museum during open hours," the artist added on Instagram. Weiwei has publicly criticized the Lego Company because it "refused" to provide an order of Lego bricks to the National Gallery of Victoria in Melbourne, Australia for the artist's upcoming installation scheduled to open in December, he said in a series of Instagram posts. "We regret to inform you that it is against our corporate policy to indicate our approval of any unaffiliated activities outside the LEGO licensing program," Weiwei said, quoting the company in an Instagram post. The artist said he learned of the refusal from the National Gallery's curatorial team, which placed the order. The exhibit, "Andy Warhol | Ai Weiwei," will require a large quantity of toy pieces to create. Weiwei previously used Lego bricks for an installation in Alcatraz Prison in San Francisco last year. Since the bulk order was refused, Weiwei started setting up collection points for Lego bricks. "Lego's refusal to sell its product to the artist is an act of censorship and discrimination," Weiwei said in a recent Instagram post. In an email to DNAinfo New York Wednesday morning, Lego spokesman Roar Rude Trangbæk said he could not comment on the cases involving customers, partners, consumers or stakeholders. "I want to stress that we respect any individuals’ right to free creative expression, and we neither can nor wish to censor, prohibit or ban the creative use of LEGO bricks by any individual – be it a child, fan or artist," Trangbæk said. "[A]s a company dedicated to delivering great creative play experiences to children, we refrain — on a global level — from actively engaging in or endorsing the use of LEGO bricks in projects or contexts of a political agenda. This principle is not new, but has been in place for decades," he said. Trangbæk added that there are plenty of ways to buy the bricks. "Anyone can purchase LEGO bricks in toy stores or in other ways and use them for any purpose they desire," he said.